President Trump’s infrastructure plan is as fatally flawed as his border wall plan. The 53-page plan released Monday, which never mentions the word “climate,” would effectively allow the Trump Administration to gut or simply avoid the federal environmental review process entirely. Note 1. That means potentially tens of billions of dollars wasted on developing projects that will likely be ruined by the impacts of a rapidly changing climate — just the way Trump’s planned border wall would likely be if it were ever built. Note 2. The President’s long-awaited $1.5 trillion plan rolled out on Monday had already been widely criticized for including a mere $200 billion in actual federal money — and a lot of wishful thinking about leveraging vast amounts of state and local revenue. Note 3. But the plan’s proposal to gut the normal environmental review process and quickly push through projects without adequate vetting is disastrous. Worsening deluges, sea level rise, extended droughts, and ever hotter temperatures will test even the most carefully designed projects. But it will likely ruin the least carefully designed ones. “The impact of not considering climate change when planning infrastructure means you end up building the wrong thing, in the wrong place, to the wrong standards,” as urban planning and climate expert Michael Kuby told the New York Times. “That’s a whole lot of waste.” Note 4. Also, failing to consider climate change could put lives at risk if infrastructure isn’t designed to handle the kind of super-storms scientists say we’ll see more of in the future. 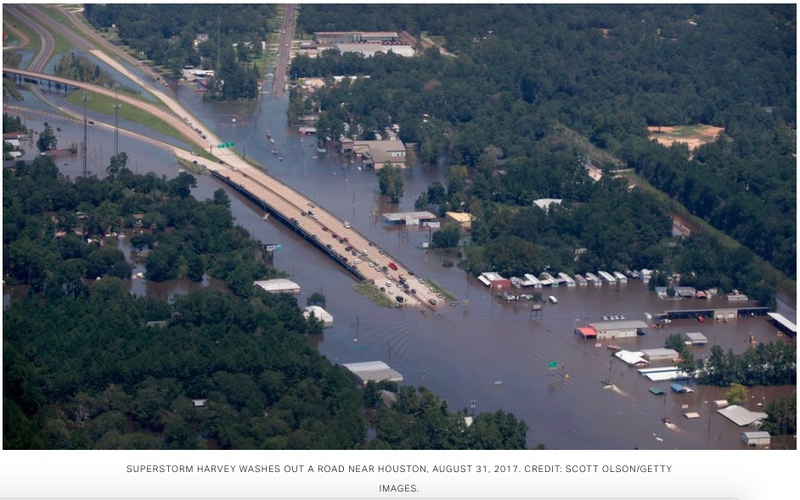 A 277-page peer-reviewed report from Trump’s own Environmental Protection Agency found that by 2100, the cumulative cost of adapting just the nation’s roads to climate change would be $230 billion. Note 5. That’s for the business-as-usual emissions scenario for carbon pollution that Trump’s pro-pollution policies would result in. The process the country uses to avoid building environmentally dangerous or unsustainable projects was created by the National Environmental Policy Act of 1969 and is called the NEPA review process. Note 6. There are three different levels of analysis possible, as the EPA explains on its website. Note 7. First, “a federal action may be ‘categorically excluded’ from a detailed environmental analysis if the federal action does not, ‘individually or cumulatively have a significant effect on the human environment’.” That determination is made by each relevant federal agency. Second, if the agency doesn’t make a determination for a Categorical Exclusion, then it performs an Environmental Assessment (EA) to determine whether or not a federal action “has the potential to cause significant environmental effects.” If the agency finds it does not, then it issues a Finding of No Significant Impact (FONSI). Third, if the “EA determines that the environmental impacts of a proposed Federal action will be significant, an Environmental Impact Statement is prepared.” And the EIS process is designed to be quite thorough. See Note 6. Trump’s plan makes it easier for federal agencies to label an infrastructure project a “‘categorical exclusion,” and circumvent any environmental review. It would “authorize federal agencies to accept funding from non-federal entities to support environmental and permitting reviews.” So potentially fossil fuel companies could support reviews that just coincidentally downplay climate change. So naturally Trump’s plan proposes that “an agency should not be required to consider alternatives that are outside its authority or outside the capability of the applicant.” In short, if an agency says it isn’t qualified to judge an alternative or an applicant says it can’t handle a proposed alternative, it doesn’t need to be considered. So the federal government could simply hand over environmental review to any state. But the fact that Trump and much of the staff of the White House and the federal agencies deny climate science — as do the governors of key states like Florida — means that climate impacts are unlikely to be part of any serious review. Note 8. Therefore, if anything like this plan were passed, it could wreak untold environmental havoc on the country — all in the name of quickly building a lot of expensive infrastructure that is doomed to fail. Note 8. Ryan Koronowski, “Every climate denier in Trump’s cabinet: Trump has surrounded himself with climate science deniers,” Think Progress (1 Feb 2018). Previous articleGreg Archer, “Reconfirmed: Transport is Europe’s biggest climate problem” Next articleTransport & Environment, "How to get rid of Dirty diesels on city roads: Analysis of diesel restriction measures in European cities to date"